Migration was on the agenda of a meeting in Auberge de Castille as European Council president Donald Tusk continued a whirlwind tour of European capitals. This morning’s visit comes ahead of Friday’s informal summit in Bratislava that is to discuss the future of the EU. In the introductory remarks, Prime Minister Joseph Muscat said the EU had to change and acknowledged it would be difficult to achieve consensus. He said Malta would play the role of “an honest broker” and was looking forward to share its ideas. 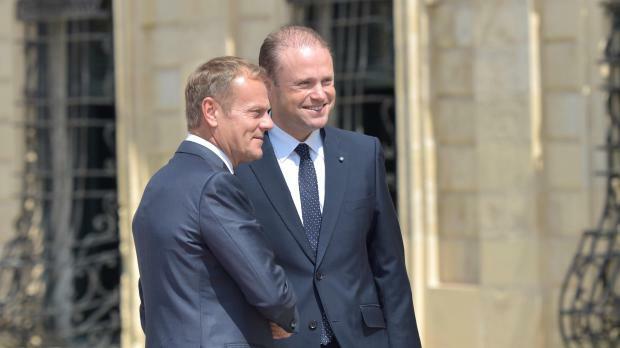 In a subsequent tweet, Dr Muscat said that he and Mr Tusk had agreed that EU leaders would meet in Malta at the beginning of next year. Mr Tusk said Malta was best-placed and had the right people to help the EU solve some of the pressing issues. In a Brexit scenario EU leaders have felt the need to address concerns about migration, security and stagnating economic growth that are troubling their electorates.